8-Bit SoundBox from macumbista on Vimeo. This tutorial aims to give instructions on how to build and program the 8BitMixTape project from start to finish. Since 2013, an international team of geeks from Lifepatch.org (Indonesia) and various groups in Switzerland [dusjagr labs, SGMK, a.n.y.m.a, Gaudi Labs, and StahlNOW] have developed a series of 8bit MixTapes, sound-codes and homemade circuit boards. 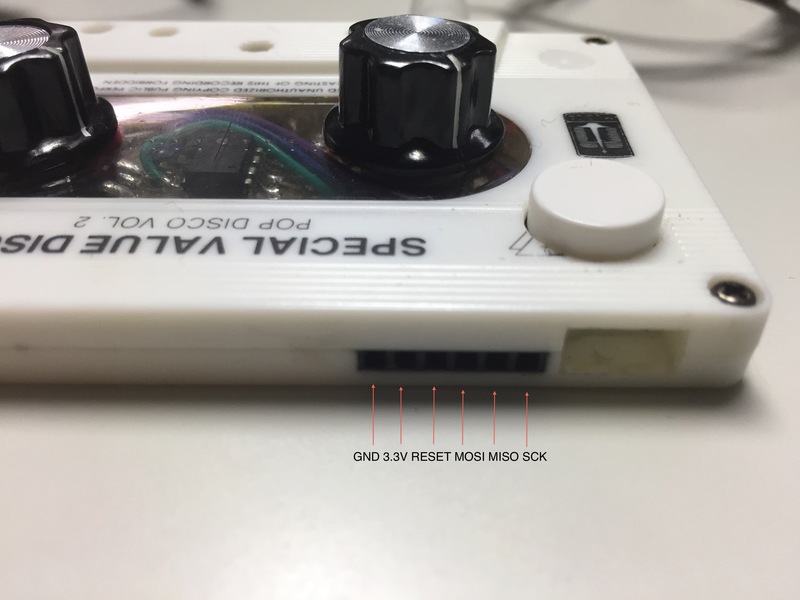 The 8bit MixTape is a very simple sounds & beats generator based on an ATtiny microcontroller, compatible with and programmable using the popular Arduino environment. Only a little bit of soldering is needed and you then can start programming your own sounds, noises and 8bit tunes. Generating a sound on an 8bit chip like the ATtiny is very easy. You can start with simple square waves, and later on go to more interesting algorithmic sounds using the famous one-liners introduced in the demo-scene by viznut. 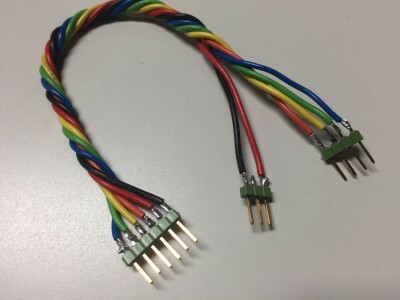 4) One connector cable, made of 6 wires with a row of 6 male header pins on each end (0.1″/2.54mm spacing). Alternately, you could simply use solid core jumper wire for the connections. 7) A way to listen to the output: external powered speaker or headphone amp + headphones (the 8BitMixTape shouldn’t be connected directly to the headphones or speakers) plus a minijack cable to connect your 8BitMixTape to the listening hardware. 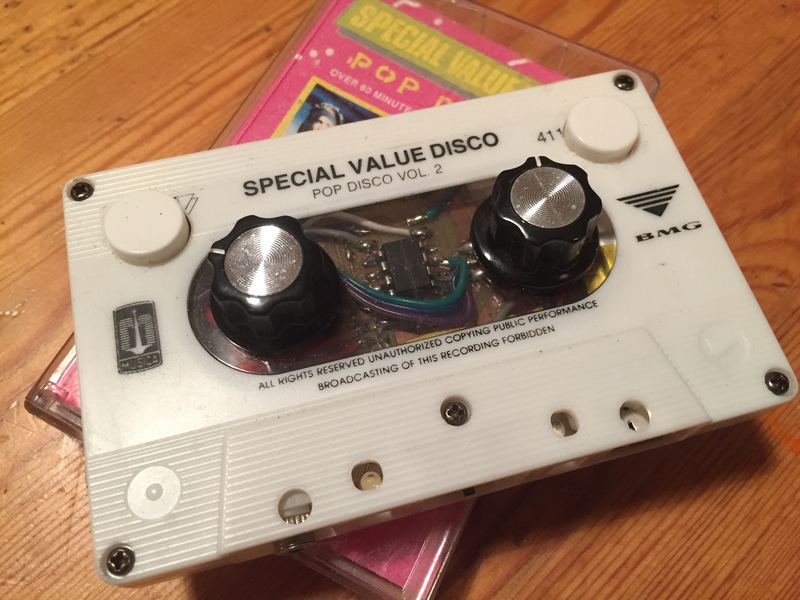 If your 8BitMixTape doesn’t have any code loaded onto it yet, you will first need to add a bootloader to it and then program it with your Arduino code. The micro-USB connector (if present) on your 8BitMixTape is for *power only*, so we will need to use an Arduino board (the UNO will be used in this tutorial) to program the 8BitMixTape. Run the Arduino development environment. Under TOOLS, select the correct board and port. Also under TOOLS, make sure PROGRAMMER is set to AVR ISP. Upload the ArduinoISP sketch to your Arduino board. 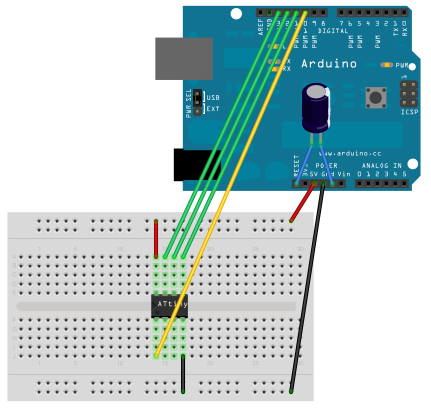 Additionally, you will need to put the 10uF capacitor on the Arduino board, with the + leg in the Arduino pin labelled RESET and the – leg in the Arduino pin labelled GND. Note that the 8BitMixTape can be powered in this way as well, without the micro-USB cable or batteries. I recommend disconnecting the micro-USB cable or batteries (if present) from the 8BitMixTape while programming it and taking the power from the header cable you have created instead. This way the second power supply doesn’t flow “backwards” into your Arduino! Restart your Arduino application and under the TOOLS->BOARD menu you should now see “8BitMixtTape”. Now click “Burn Bootloader” under the TOOLS menu and wait for confirmation that the bootloader has been sent to the 8BitMixTape. Now you are ready to rock your own code on the 8BitMixTape! To start with, copy the following code into your Arduino program. In this code, the right-hand button switches between 8 different algorithmic, interactive compositions, and the two potentiometers change different parameters within them. 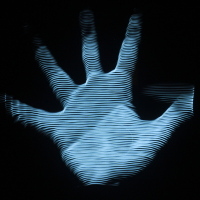 are the “one-liner” algorithmic compositions, which use different bit shifting and mathematical operations from C code to generate “audio” (i.e. a series of bits) sent to the PWM output pin of the ATtiny as variable “v”. 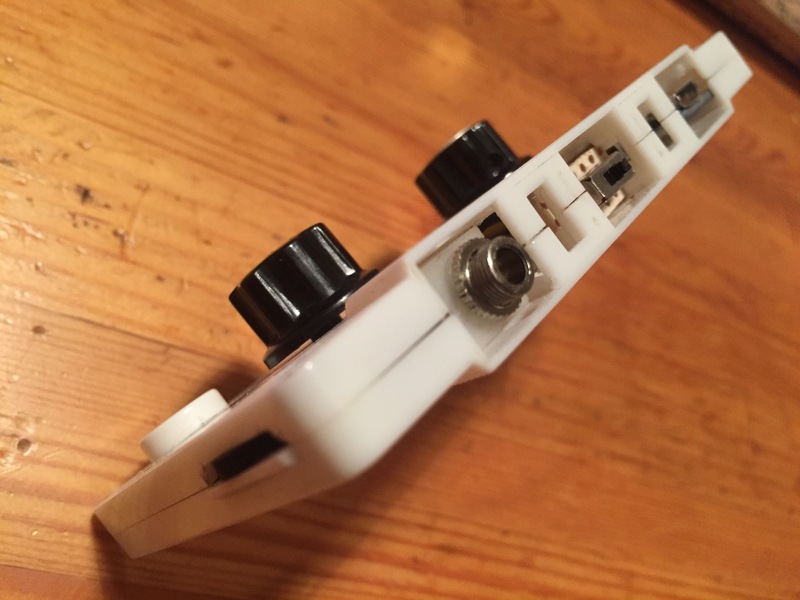 Anything marked “c3” or “c4” is where the potentiometers affect the running code. 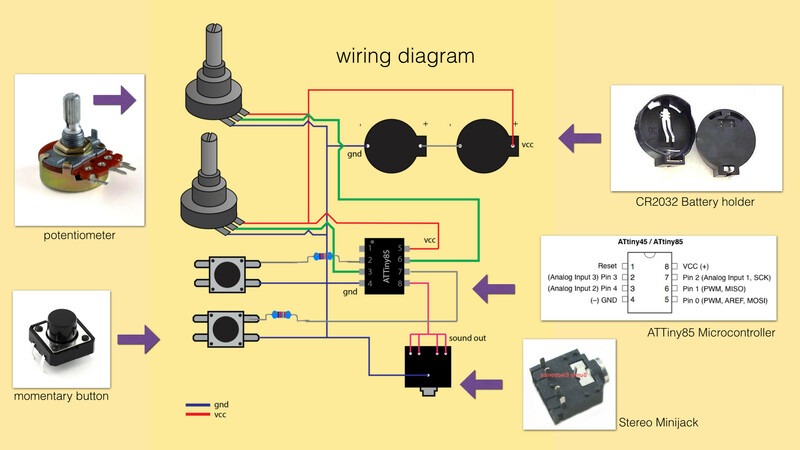 The “c3” potentiometer usually controls the speed of how quickly the algorithm repeats itself, while the “c4” potentiometer introduces different amounts of bitshifting into the running code. You can try replacing the one-liner with some of the commented-out lines instead for different versions. and replace the number with the case number of the composition you want to start with. The button will still move forward if you press it running this code. Or you may just want to start experimenting by replacing the numbers and bitwise operations (“>>” and “<<“) with other values and directions, by replacing the fixed values in the code with variables from the potentiometers (“c3” and “c4”), or by adding additional math operations (+, -, *, /, ^, &, %, pi, sin, tan, sqrt, etc etc…) to any of the fixed values or variables. A great many of the one-liners found in the text file linked were “discovered” accidentally through trial-and-error, rather than by design with an outcome in mind from the start. So go crazy! There are already a great many hardware versions of the 8BitMixTape. Mine was sent to me by Andreas Siagian of Lifepatch.org. It has a micro-USB connection for charging an internal battery (not sure if mine is working yet) and a snappy cassette-tape enclosure! Other 8BitMixTapes have built-in batteries for powering. The switch in the middle of the bottom side of the cassette turns the unit ON (right hand position) and OFF (left hand position). It should be in the OFF position to charge, and the red LED on the charger PCB (behind the min USB connection) turns blue when charged. The charge should last about an hour. I absolutely DO NOT recommend listening to the 8BitMixTape when the micro-USB cable is connected, as the USB power and circuitry for charging the battery create a lot of extra noise. 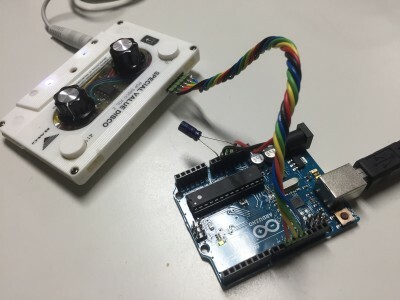 Also, be careful not to connect the micro-USB power cable when the 8BitMixTape is connected to the 3.3V pin of the Arduino, as the USB power can flow “backwards” into the Arduino 3.3V and mess things up in the Arduino. Another solution could be to not include the 3.3V in your header cable, and use the USB or battery power instead while programming the 8BitMixTape. I also recommend disconnecting the programming header pins from the Arduino when running the 8BitMixTape. You will see that I separated the two parts of the header cable to allow the power to remain connected when the programming pins are disconnected. Have fun and many thanks to Andreas Siagian and Marc “Dusjagr” Dusseiller for their time and help making this tutorial. Powered by WordPress v 5.0.2. Page in 0.526 seconds.